After 12 successful seasons, the wooden pavilions have been replaced by a new and permanent building. The result is an internationally attractive location inspired by the island of Bali and aimed at local residents and (business) guests of the RAI. Strandzuid is an initiative by RAI Amsterdam and Unlimited Label (Vondelpark3, Caffe Esprit, Strandzuid). 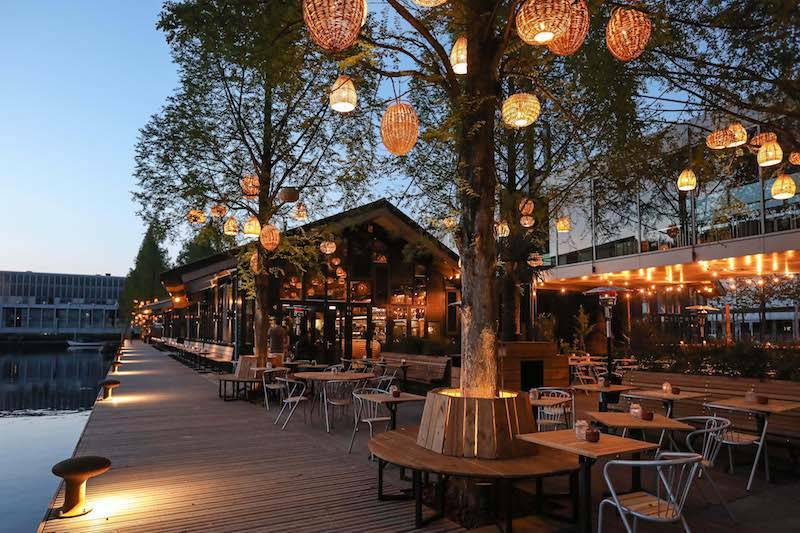 Since its establishment in 2005 Strandzuid has developed into a summer business and leisure venue where the dynamics of the city and RAI Amsterdam are combined with a relaxing beach setting. From the get-go it became a popular destination for Amsterdam residents as well as a favourite hang-out for exhibition and conference visitors. Maintaining this function was the starting point for the rebuilt venue. In addition, the new Strandzuid enhances its position as an event location that can be used as a stand-alone venue or supplement to the RAI facilities. The Restaurant (à la carte) has a capacity of 300 seats. Moreover, Strandzuid includes The Boat House, The Beach House, The Jetty Bar, The Beach Bar and Playground. Various facilities serve as excellent destinations in their own right when the weather conditions are inclement. Strandzuid is a fine example of the public function that RAI Amsterdam aims to add to its complex. By creating facilities with a value for both its own business and the surrounding neighbourhood, the RAI aims to become even more integrated within Amsterdam society. Other examples include The Roast Room restaurant, the recently opened Sixt rent-a-car facility and the nhow Amsterdam RAI hotel (2019). Strandzuid is part of Unlimited Label, an Amsterdam company with various hospitality and event venues in the city, including Vondelpark3 in the famous park and Caffe Esprit on Spui square.